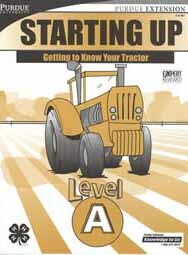 Starting Up (Tractors, Level A) is designed for youth with little or no prior agricultural tractor and equipment experience. Project skills covered in this book include: proper safety procedures, mechanics of the engine, accessory equipment, how to use the operator's manual, maintenance of the agricultural tractor, and function of different operational systems. 32-page color manual.